Every year millions of tourists visit Turkey from around the world who are looking for the best places of rest. Last year alone, the country was visited by over 15 million people. Turks themselves for your vacation choose the beaches, which are usually located away from the hotels and resorts. However, the state and guests can relax on the beaches, which are marked with «blue flag» that indicates their purity. 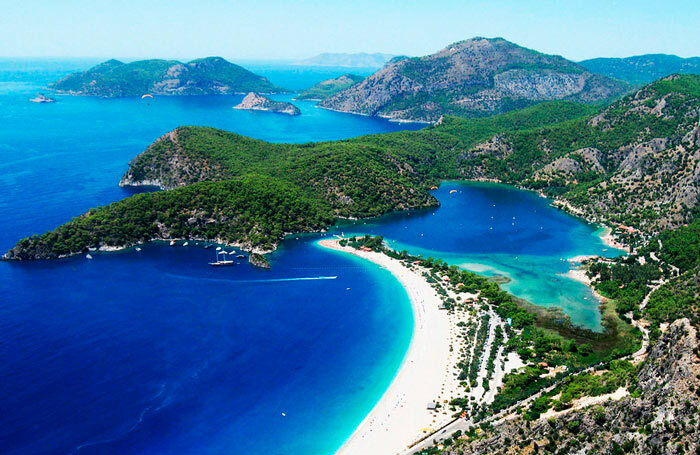 Next, we consider the best beaches in Turkey, which is worth a visit in the country. This famous place is just not possible not to be attributed to the best beaches in Turkey. It got its name thanks to the unique color of the water — it really has a bright blue color. The beach is located between two mountains, so there is almost never a strong wind, and therefore the sea is almost always calm. Even in very strong storm waves do not rise by more than 20 cm, and is near the beach. The beach is sandy, without rocks and pebbles. Located close to the Blue Lagoon beach from the town of Fethiye, at a distance of 8.5 km to the south. The coast is only one hotel to get to the other, it is necessary to overcome the serpentine road. Blue Lagoon — a perfect place for families with children, as it does not carry out noisy celebrations, no discos and clubs on the beach and in the surrounding area. Most of the spaces occupied by shops, restaurants and stalls with souvenirs and local fare.